If you are an allergy sufferer, you have most likely used either an over the counter or prescription strength medication to alleviate the symptoms of your allergies. Unfortunately, these medications only provide partial temporary relief and some come with severe enough side-effects to make many consider alternative treatments. The good news is that acupuncture for allergies combined with Chinese herbs is a very effective and safe treatment. 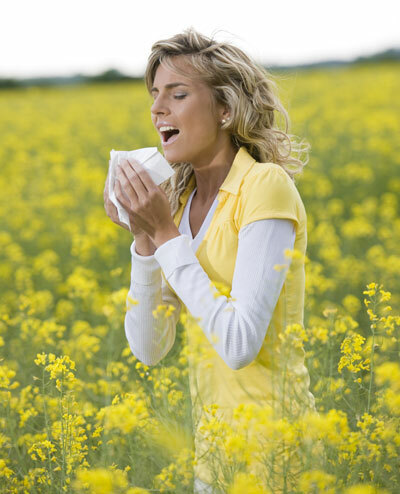 Many people suffer from hay fever (the medical term is allergic rhinitis) between the spring and fall time. Some even have symptoms year round. Allergic rhinitis occurs when the body’s immune system overreacts to particles (allergens) in the air that people breathe in. Those allergens include pollen, dust, animal fur, and mold which cause runny noses, sneezing, watery and irritated eyes, itchy eyes, ears, noses and throats. Most people will turn to over the counter (OTC) medications which are available in pill form and nasal spray form. The most popular nasal sprays for allergies are Nasacort® and Nasonex®. The most popular pill forms are Claritin®, Zyrtec®, and Allegra®. Others will visit their doctors and have one of the newer allergy medications prescribed for them. Once again, these come in pill or nasal spray form. Both over the counter and prescription strength medications have some side-effects which range from moderate to severe. These side effects include drowsiness, rupture of the veins in the nasal passages, dry cough, and conflicts with other medications. Acupuncture and Chinese herbs come with little to no side effects and are quite effective at not only treating allergy symptoms, but controlling the allergies to the point that they no longer negatively impact the quality of your life. What happens in an acupuncture treatment for allergies? Dr. Feng Liang will take very thin stainless steel needles (acupuncture needles) and insert these into specific points around the nose and possibly into the forehead, temple area and between your eyebrows and into your hands and feet. Then Dr. Liang will manipulate the needles to make sure you get the maximum healing power from the acupuncture treatment. In Dr. Liang’s 20+ years of practicing Chinese medicine, she has found some very specific points on the body for her acupuncture needles that provide immediate relief. These points open the nasal passages and drain the sinuses. These points can restore nasal functions and build strength against allergic reactions. Does this procedure hurt? For most areas that the needles are inserted you will not feel any pain. You will feel a pressure sensation in the needle site which is the healing effect for your allergies. When your symptoms are relieved during the treatment, the pressure sensation will subside. Dr. Liang does not want you to be afraid of the “pressure sensation”. This is the power of Qi that will heal your allergies. Dr. Liang will make sure you get those energies when she provides her acupuncture treatment. Patients actually enjoy the healing power she gives to them. These acupuncture treatments last on average anywhere between 20-45 minutes and will relieve your nasal congestion almost immediately. You will walk out of Dr. Liang’s office breathing better through your nose and if you had any wheezing, this will either be completely gone or very much improved. If you had any sinus headache, this will also be greatly improved. Dr. Liang recommends that patients receive a twice per week acupuncture treatment when they start to experience allergy symptoms. You will feel relief of your symptoms in only one or two treatments. However, it is important to continue twice per week treatments for approximately 10-12 sessions for maximum benefits. Please note that unlike western doctors who only treat the symptoms of allergies, traditional Chinese medicine doctors seek to build a healthy and balanced constitution. Think of it as treating the problem from the inside out instead of the outside in. Dr. Liang will also prescribe Chinese herbs to be taken in conjunction with the acupuncture treatments. These will enhance the effect of the acupuncture treatments and make you feel more balanced, stronger and healthier. The Chinese herbs will either be prescribed to you in the form of pre-packaged very small black balls or Dr. Liang will create a unique formula for you that you will make a tea from. In most instances, Dr. Liang is able to prescribe the pre-packaged Chinese medicine that is convenient to take and has no side effects. Acupuncture for allergies is quite effective. When coupled with specific Chinese herbs, acupuncture can eliminate most symptoms and prevent allergies from having a negative impact on your health. To make an appointment to see Dr. Liang, please call (212) 779-0468 or click here to fill out our appointment form.